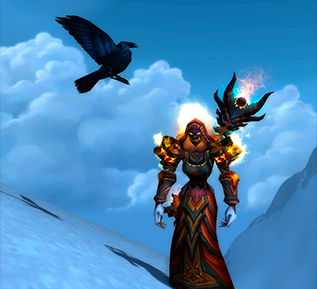 Elfuego is a lvl 90 Mage, he is the GM of Demonic Hordes, a lvl 25 Hordeside raiding guild on Moonguard. He built wowpetbattle.com so he could educate people on pet battling, creating a database of pet battling information, videos, guides, and to promote an environment for players to share and explore pet battling experiences. As long as theres new information on fights, pets, trainers, anything else assocaited with pet battling, I will do my best to keep everything curent and fresh! 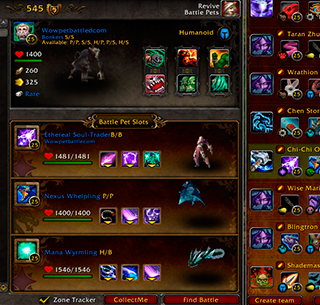 wowPetBattle.com was designed and intended to be used as a one stop resource for strategies, information, and videos for the Pet Battling aspect of World of Warcraft's in game pet battle system, but it is in no way affiliated, endorsed or supported by blizzzard entertainment. Feel free to contact me at : demonichordes@gmail.com Im always interested in new ideas, information, strategies, and affiliations. I would like to be a resource that people seek out and share, so leave your comments in our Youtube videos or facebook! I once heard that if you do what you love, you will never work a day in your life. Since creating this site, I have come to understand exactly what that means. wowpetbattle.com is a labor of love, but your support is always welcomed! Feel free to donate whatever you decide via paypal : demonichordes@gmail.com Thank you guys for all your support! Watch the video as they all GET OWNED!